Joe and Peter make a quick stop in Jackson on their way to Alaska. 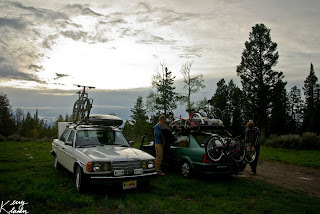 A group of us went camping up in Curtis Canyon. For dinner, we made some delicious campfire food. We cooked burritos with bacon, eggs, peppers, cherry tomatoes, cheese, and refried beans. It worked out perfectly.